As I mentioned in GreenVolts at BIG Solar, I attended the 2nd Berkeley-Stanford CleanTech Conference, BIG Solar: “Utility Scale Solar Power Generation”, to also cover the participation of Cool Earth Solar (CES) on the “Innovations in Technology” panel. There has been little news from CES since Cool Earth Solar attracts a Hot $21 Million in Series A Financing other than COOL EARTH SOLAR OPENS NEW HEADQUARTERS just before the conference. Cool Earth Solar, Inc. CEO Rob Lamkin began his reshaping solar energy presentation by sizing world electricity demand at 30,364 TWh (TeraWatt-hours) in 2030 with a CAGR (compound annual growth rate) of 42% from 2008 to 2030. Citing 14.7 TWh of world solar energy production in 2007, the enormity of the opportunity for solar and renewables to address this worldwide electricity demand growth becomes crystal clear. Recognizing the opportunity, CES is focused on exploiting the scalability of their photovoltaic concentrator solution using plastic thin film (PET or Mylar) instead of metal mirrors and glass envisioning GigaWatt scale power plants. Two sheets of 25 micron thick plastic films are used to construct the concentrator balloon; one side is aluminized. 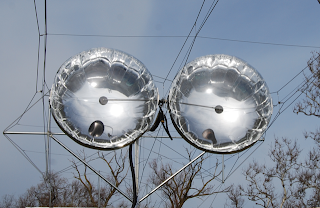 Once inflated, the aluminum coated side concentrates sunlight at a ratio of 300-350 times onto a solar cell located in the focal area. The solar cell is mounted to a round receiver extended by a boom from the side of the balloon structure. Photo Credit: Cool Earth Solar, Inc. Shorter term we’re building our first pilot power plant right now. And that needs to be done like yesterday. And my staff and the team at Cool Earth get tired of hearing me say this truly needs to be done yesterday. Per Mr. Lamkin, CES will manufacture the Mylar solar concentrator structures. In an audience questions and answers session, Mr. Lamkin stated Cool Earth Solar would begin by using III-V Double and Triple Junction terrestrial solar cells, for example from Emcore, but they plan to later switch to silicon solar cells out of concerns for GigaWatt scalability. For further information, I have been able to find two Cool Earth Solar patent applications published by the USPTO (United States Patent and Trademark Office). In order to view the USPTO images, your browser will require a TIFF image plug-in capable of displaying “TIFF files using ITU T.6 or CCITT Group 4 (G4) compression”. Please see “Patent Full-Page Images” for details. I am using the AlternaTIFF Plug-in (http://www.alternatiff.com/) with Firefox. Mylar balloon sparks power outage by Banks Albach with the Palo Alto Daily News. How do they keep the concentrated sunlight from melting the clear part of the balloon near the focus?